We are manufacturing of Stainless Steel Condencer. - Orientation : Horizontal, Vertical, Inclined. Utility Services Specialist Pvt. Ltd.
We are engaged in manufacturing of Condenser which is known as the thermal unit which helps in condensing vapor into the liquid. To lessen the loss of the volatile components it is designed to offer the maximum cooling surface area. We are offering high quality Drying Condenser. The hot gasses are cooled and therefore their volume is substantially reduced. This reduces the gas load on the vacuum pump and saves energy. 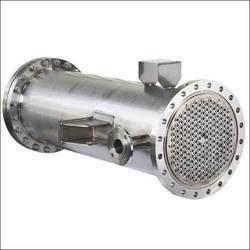 The design of the Drying Condenser ensures that all condensates are converted to liquid and all non Condenser gases are reduced to their minimum volume. In order to keep pace with the never-ending demands of customers, we are involved in offering a wide range of Thermal Condenser. Reckoned amid one of the credible market names, we are willingly engaged in offering to our patrons Condenser. Our Industrial Condenser is manufactured from qualitative raw material and is known for it’s durability and wide temperature tolerance. Condenser is a thermal unit, which is used to condense vapor into liquid. This unit is specifically designed to provide maximum cooling surface area so as to minimize loss of volatile components. 2. Multi layer Polypropylene film.